I am working on two important pieces of legislation that will expand our fight against climate change. Please send a message for lawmakers to act now. California has ambitious goals to reduce climate change contributing greenhouse gas emissions. With nearly 40 percent of these emissions coming from transportation, further progress for our planet requires a shift in what we drive. To ensure that we have a healthy environment, we need to drastically reduce air pollution and greenhouse gasses caused by transportation on highways and roads. 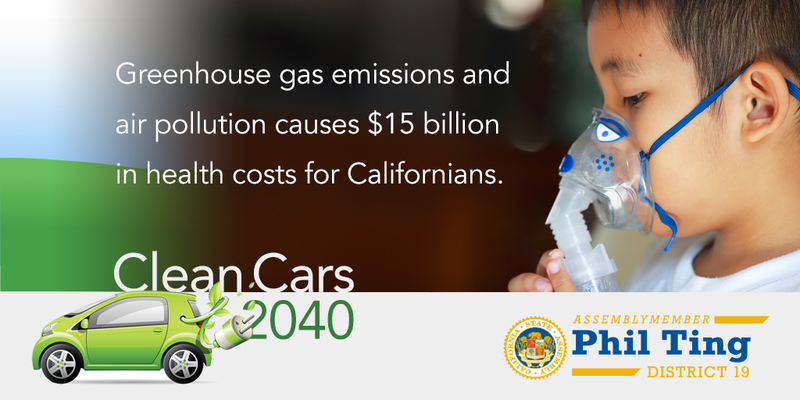 We were unable to advance AB 1745, the Clean Cars 2040 Act, but we will continue the fight next year and reintroduce it. We can reach our climate goals by requiring all new vehicle registrations to be zero-emissions vehicles by 2040. We must keep trying. AB 2127 requires the California Energy Commission to assess our state's electric vehicle (EV) charging infrastructure and what we'll need in the future. Governor Jerry Brown signed an executive order earlier this year setting a goal of five million zero-emission vehicles on California roads by 2030. But the biggest hurdle to widespread adoption is the lack of EV charging station. While the state, utility companies and others are adding to the infrastructure, no one is coordinating the effort to ensure we'll have enough. With over 20 EV models now available and more in the works, there has never been a better time to electrify our cars and build up supporting charging stations.